Horse flies and deer flies are among the largest and most annoying flies that we encounter. Their painful bites can make working or relaxing outdoors difficult. Horse flies (Figure 1) are moderate to large flies (14 to 19 mm long); their wings are clear and their thorax grayish-brown. Deer flies (Figure 2) are small to medium flies (10 to 13 mm long). Their wings are tinted smokey gray-brown or have dark patterns, and their thorax is greenish-yellow with dark stripes. The narrow eggs are cylindrical and 1 to 3 mm long. They are initially white but turn brown to black in a few hours. An egg mass consists of 200 to 500 eggs cemented together by a waterproof secretion. Mature larvae are approximately 10 to 19 mm long and up to 3 mm wide. Deer fly larvae tend to be smaller than horse fly larvae. Both types are white, brownish or greenish in color. Spindle-shaped, the larvae taper to a point at both ends. The head is small, cylindrical and retractable. Pupae measure about 15 mm in length and are white at first but turn light brown in a few hours. They are rounded anteriorly and tapered posteriorly with a double row of spines on segments 2 through 7. Horse and deer flies are found worldwide. More than 40 species occur in North Carolina, but only about a dozen are common. These biting flies are often encountered along hiking trails, narrow lanes and roads and at the edges of woodlands. They are numerous and annoying along the coast and near their breeding and natural feeding sites such as flood plains of swamps, streams and rivers and around ponds, salt marshes, and beaches. Female tabanid flies are active and persistent blood-sucking pests of cattle, horses, deer, other warm-blooded animals, including at times, people. Females also consume nectar. Deer flies tend to bite around the head and neck areas. 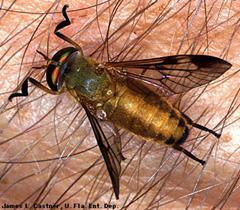 Horse flies often attack the legs. Birds are usually not attacked by these flies. Male tabanid flies do not feed on blood. Males consume nectar and plant sugars. 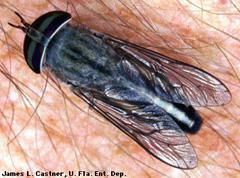 Horse fly larvae are predaceous on small invertebrates and consume organic matter. The food habits of deer fly larvae are not known. In addition to causing great annoyance in some recreational and work areas, horse and deer flies are suspected vectors of important livestock diseases: hog cholera virus of swine, equine infectious anemia virus of horses (EIA) and anaplasmosis bacteria of cattle and other viral and bacterial diseases. Diseases such as EIA are often associated with lowlands and poorly-drained areas frequented by biting flies. Female horse flies and deer flies inflict painful bites on people and animals as they seek a blood meal. Males do not bite. These flies are aquatic or semi-aquatic in breeding habits. Eggs are laid in clusters on objects, such as plant stems and leaves, near the water. Eggs hatch in about one week and the young larvae crawl or drop into water or wet soil. The larvae undergo 4 to 9 molts and may require a month to a year or more to fully develop. When mature, the larvae move to dry areas near the surface of the soil to pupate for 1 to 4 weeks. Most flies emerge sometime from May through August. Some species of horse flies have two generations per year in coastal Georgia. Most species of horse flies and deer flies have a 1-year life cycle. However, in some cases, 2 or 3 years may be necessary to complete development. In other cases, a full generation and a partial second are produced within a single year. Horse flies and deer flies have a few reported parasites and predators. However, these natural enemies are not effective as true control agents. Chemical control of horse flies and deer flies is difficult. Some repellents give temporary relief but are not extremely effective. There are non-chemical adhesive strips or "traps" that can be attached to hats and are reported to be somewhat effective in catching deer flies. Large-scale pesticide applications to control adult horse flies and deer flies are only moderately successful primarily because it is difficult/impossible to identify their actual breeding sites. Examples of pesticides that can be used are found in the North Carolina Agricultural Chemicals Manual. Always read the label and follow directions and safety precautions. Treatment of bogs, marshes and low-lying areas to control larvae is impractical because of the large areas which larvae inhabit. Box traps for horse flies apparently help reduce horse fly populations in small areas such as home yards and campgrounds, particularly if high vegetation on the perimeter limits fly infiltration to relatively narrow fly-ways or fly-paths. Box traps have 4 shiny black sides, 16 x 32 inches, suspended by legs 24 inches from the soil. The top of the box trap is a 32 x 32 inch metal screen. Do not use a plastic screen as it can be damaged by birds. At the bottom, 2 rectangular 32 x 20 inch screens are fastened on opposite sides and slanted upward so that a 0.53 inch slot is left for the flies to crawl into the trap. The attractiveness of such a trap is enhanced by suspending under the trap and 4 to 6 inches above the soil a 14-to-16 inch ball painted shiny black. Vegetation should be kept low around the trap. With deer flies, some success has been achieved using blue-colored cups or buckets covered with glue (such as "Tangle Trap"). An example of these traps can be found at The Trolling Deer Fly Trap website.